I’m Gina Applebee, a blind PhD student, and my goal is to live in my own indepenent living space, and build my own tiny home. Now that I’ve raised enough funds to cover the payment of the trailer foundation for my tiny home, I Got Legs has agreed to help me raise the rest. I’ve been living with friends and roommates for the past 16 years now, and moving into an independent living space is essential for me at this point in my life. A tiny home would be ideal for my blind feng sui, simple lifestyle, and minimal needs. Inhabiting this tiny home while completing my PhD studies, I will have the stability to grow and contribute more to my communities and career. African Wheelchair Initiative NEEDS LEGS! Hello. 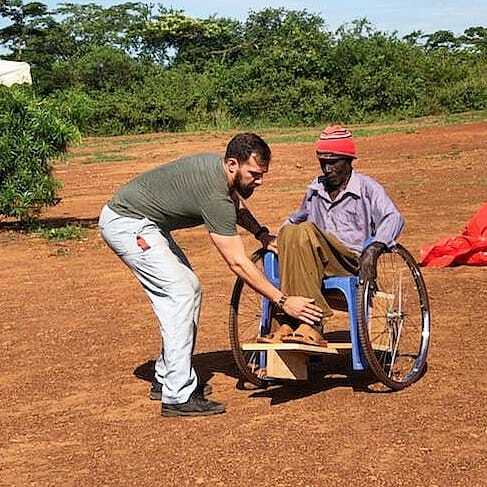 My name’s Jerry Roettger and I’m trying to start a process in Uganda where we teach locals there, how to make wheelchairs using nearby and affordable supplies. That way they can continue to make wheelchairs even after we leave. My team of volunteer PT students and faculty from the Medical University of South Carolina and I will be going to Africa again in May 2019, to run a seating clinic through the One World Health organization, in Masindi. The money I raise goes directly to fund my trip and help purchase power tools I’m bringing and leaving with the locals of Uganda. Our intentions are to treat patients while simultaneously showing the low supply and high demand for wheelchairs there. Eventually, we hope to draw enough attention and funding to officially establish a self sustaining organization. Your help is needed, and any contribution, big or small is greatly appreciated.